Touting "turtle power" and all that jazz, the horribly mutated teen ninjas will be hitting Nintendo's portable money maker in an all new adventure, courtesy of Ubisoft. Thanks, Ubisoft! 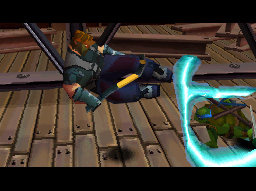 Like the name implies, the DS title will be similar in gameplay to the Turtles arcade games, most recently seen in the XBLA/PSN remake of Turtles in Time. You and a random stranger you pull off the street can team up to take on Shredder and his smelly Foot gang if you so choose. Going to PAX this weekend? You'll get a shot at playing if you seek out the Turtles party bus. Everyone else in North America can start camping outside their local game shop until it's Holiday release. Or you could just check out the screens below. Your choice. Is this a port or a new game? The remake kinda blew, so it's no real big loss. This is a new game anyway, I'd rather have that then a sullied remake of a game that didn't age well. Anyway, I hope this game comes out good, TMNT games should be just like the classic Konami arcade games. I was worried when they said no WiiWare for us. The remake did look pretty bad anyway, though no telling if this will be any better since it's Ubisoft. It can't be worse than the DS turd-fest that was 'TMNT'. I hope it will turn out very well! I read nintendo power today and this game had a platform typo. This says to be a wii game while this is a DS game. Why the crappy 3D instead of a proper 2D sequel to the glorious arcade games? Ds should stick with it's own games instead of trying to be it's older brother the wii. The ds is just a boring little device anyways,i guess mine can continue to collect dust.